Cloud computing, as we know, is perhaps one of the most talked about topics in the field of Internet technology. Ever since it burst into the scene, about a decade ago, we have seen a gradual large-scale revolution, where several kinds of computing technologies are supported on the cloud. On the whole, the cloud is basically an umbrella term that covers on-demand access to various computing resources. Today, cloud computing is viewed as a utility that offers powerful computing and resources, at extremely affordable costs. So, in this era of cloud computing, it is very much essential to know about the most used key terms. It will help you to understand and communicate effectively. Cloud computing, or what is simply referred to as the cloud, can be defined as an Internet-based computing that largely offers on-demand access to computing resources. These resources comprise of many things, such as application software, computing resources, servers and data centers etc. Cloud service providers usually adopt a ‘pay-as-you-go’ model, something that allows companies to scale their costs as per need. It allows businesses to bypass infrastructural setup costs, which was inevitable prior to the advent of the cloud. Cloud computing mainly makes it possible for companies to get their applications deployed faster, without the need for excessive maintenance, which is managed by the service provider. This also leads to better use of computing resources, as per the needs and requirements of a business from time to time. While the Internet is full of terms related to the cloud, here are some pretty basic, but important ones, that one should definitely have some knowledge about. Knowing these key terms will help you understand industry developments and future trends in cloud computing. Let us have a look and understand the basics. This is a generic term which refers to any service which is available as cloud enabled service through internet. Some time it is also called ‘everything-as-a-service’. It includes SaaS, DaaS, PaaS and IaaS etc. SaaS comprises of software applications, which are run on distantly located computers that happens to be owned, as well as operated by others. A good example of such an application would be Google Docs, which is an online word processor based on cloud environment. SaaS offers several key benefits, such as instant access and usage of applications, accessibility from any machine that is connected, and also that there is no likely loss of data, as it is stored in the cloud. PaaS is mainly a cloud-based environment that offers everything that is required to support the building and deployment of cloud-based applications. This is possible without the developer of the application having to purchase hardware, software, management and even hosting. The primary benefits obtained from PaaS are that applications may be deployed really fast, without worrying about the platform. Also, these service models largely save costs and abstract the underlying intricacies. IaaS is primarily a model whereby, businesses are provided with several kinds of computing resources, such as servers, storage, networks, and data center spaces. The provider here, charges a certain amount of money based on the resources that are in use. IaaS offers several benefits, which include non-requirement of investment on hardware or upgrades, and the availability of dynamic and flexible services as per requirements. A very common term that you may have come across is public cloud. This is basically those parts of the cloud that are owned and also run by companies that provide accessibility of computing resources to the general public. In the case of public cloud, users need not purchase software, hardware or even the infrastructure. All of these are managed and maintained by a provider, who may or may not charge a nominal fee. This is basically the part of the cloud that is only meant for a certain organization, exclusively for its usage. The maintenance can be done internally by the organization or even outsourced to a third party service provider. In terms of security, private cloud easily stands out, when compared to the public cloud. The term hybrid cloud implies the usage of a private cloud infrastructure, along with the use of cloud services that are public in nature. Truth be told, a private cloud cannot really exist solely by itself. Most businesses, which have a private cloud setup, end up accessing public cloud resources for various day-to-day tasks. This gives birth to the term hybrid cloud. AWS simply stands for Amazon Web Services. American giant Amazon was perhaps one of the earliest companies to jump into the cloud computing bandwagon. Presently, Amazon Web Services is a cloud service provider with a presence across the Americas, Australia, Europe and Asia. Being a part of AWS, EC2 is what is known to offer scalable cloud computing options to developers across the world. It is used for the deployment of cloud-based applications on virtual servers that can be rented. Users of EC2 can even opt to pay for the resources they use by the hour. An auto-scaling feature allows developers to dynamically adapt to changes in requirements. This is again a part of AWS that allows for the storage and backup of data on the cloud. It offers highly scalable, unlimited archiving and backup option for the users of AWS. This is a term that means replacing the traditional IT operations of an organization, with cloud services being outsourced to a cloud provider. The biggest benefit of this is low costs and easy management of computing resources. These are cloud offerings mainly intended to be used by people for their personal use. A fine example of this is Drop box, as it offers cloud storage facilities to users. The ability of a single platform to run and hold more than just a process, application or virtual machine, for many users can be labeled as multi-tenancy. Cloud computing environments are usually available to multiple users and hence, are mostly multi-tenant. This is a cloud environment that is built to serve the needs across several specific industries. Some of the most common areas include healthcare, government tasks, financial services, and more. This term refers to the ability of an application and data to move from one cloud service provider to another cloud service provider. Cloud backup means to store the data to a remote cloud based server. This is nothing but a cloud storage which stores the data. 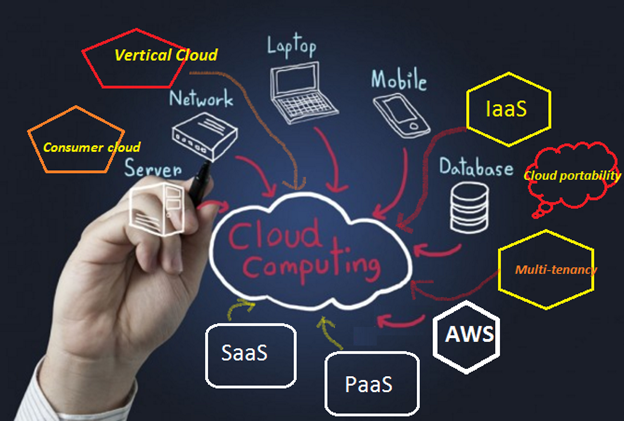 It means to make a cloud computing environment by enabling software, infrastructure, applications, clients etc. Cloud migration is nothing but migrating on premises application, data, software, databases etc into a cloud environment. This may be a partly or full transition. This term means to assemble multiple cloud computing environments. In a business scenario, there may be a need to provision multiple cloud computing systems, so it can be referred as cloudstorming approach. It refers to an entity which is responsible for managing relationships with various cloud service providers. It acts as a middle man between service providers and service consumers. As cloud computing dominates the computing technology domain, there are certainly several terms that we must be familiar with. The above list primarily aims to enlighten you with some of the important terms that one may have come across. As cloud computing is evolving, new technology and terms are also introduced frequently. So we have put our effort to capture the most frequently used key terms and provide some explanation. Hope it will help you understand the basics.